CESSPOOL was the Chief Executive Officer of a huge multi-national corporation with vast holdings in oil refineries, chemical plants, and mills. 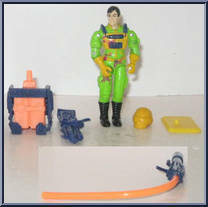 In an effort to placate environmental groups that were c. . .
Clean-Sweep from Eco Warriors in Yellow Suit with Green Accents Once the insidious Cobra polluters have spewed their toxic sludge into a previously pristine environment, there is nothing left to do b. . .
A graduate of Special Forces School as well as the Flight Warrant Officers' School and a former Rhodes Scholar, Flint was a natural choice to head up the new G. I .Joe Environmental Force. When equipp. . .
OZONE is the Eco-Warriors' specialist in atmospheric-dispersal toxins and forms of airborne sludge and other harmful chemicals while replenishing the ozone layer around the Earth's atmosphere. The bac. . . The SLUDGE VIPER never runs out of ammo, since his sludge gun has a built-in decomposition accelerator which can create toxic sludge out of whatever is at hand, and propel it at lethal velocities with. . . 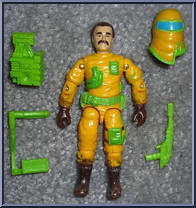 The original Cobra TOXO-VIPERS were disparagingly referred to within the ranks as the "Leaky Suit Brigade," and assignment to them was considered severe punishment. The new Toxo-Vipers sport. . .